The Patton 2168 and 2168A have reached end-of-life. our recommended replacement units are the Patton CopperLink CL1212 and CL1214 units. Switch Selectable—Asymmetrical or Symmetrical line rates up to 16.67 Mbps! Made in the USA Patton’s American-made manufacturing process delivers high-quality networking solutions with reliability you can trust. 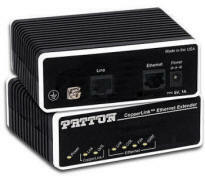 The Patton Model 2168A Multi-Rate CopperLink Ethernet Extender enables the utilization of existing copper infrastructure for high-speed Ethernet extensions at data rates up to 16.67 Mbps. The 2168A includes seven asymmetrical and symmetrical settings which provide the flexibility to increase the distance or speed of the Ethernet connections. CopperLink applications include Ethernet extension, medical imaging, video-conferencing, Ethernet Bridging, and inter-connecting remote devices or remote networks to a central LAN. The multi-rate symmetrical line rates ensure the highest possible data rate is achieved over various lengths and types of copper wire and environments. Multi-rate asymmetrical line rates make the Model 2168A the ideal solution for service providers who want to differentiate their services or extend the reach of their customer base. The Model 2168A allows service providers to offer unparalleled performance for such applications as always-on Internet access, real-time bi-directional video streaming, and various multimedia applications.